We looked closely at the Hypnerotomachia Poliphili, 1499. A chapbook is an early type of popular literature printed in early modern Europe. Chapbooks were mostly small paper-covered booklets, usually printed on a single sheet folded into books of 8, 12, 16 and 24 pages, often illustrated with crude woodcuts, which sometimes bear no relation to the text. They were produced cheaply. “Chap” from chapman, an itinerant salesman. “Jemmy” Catnach and his penny broadsides. CATNACHERY. (Book Club of California). Muir, P.H. San Francisco: The Book Club of California, 1955. The Catnach Press was founded in 1813 by James' father and James Catnach the son died in 1841. The press was a prolific publisher of children's books and ballads. We looked at the work of "such artists as Cruikshank, Leech and 'Phiz' in England, and Doré, Grandville, and possibly Daumier, in France." 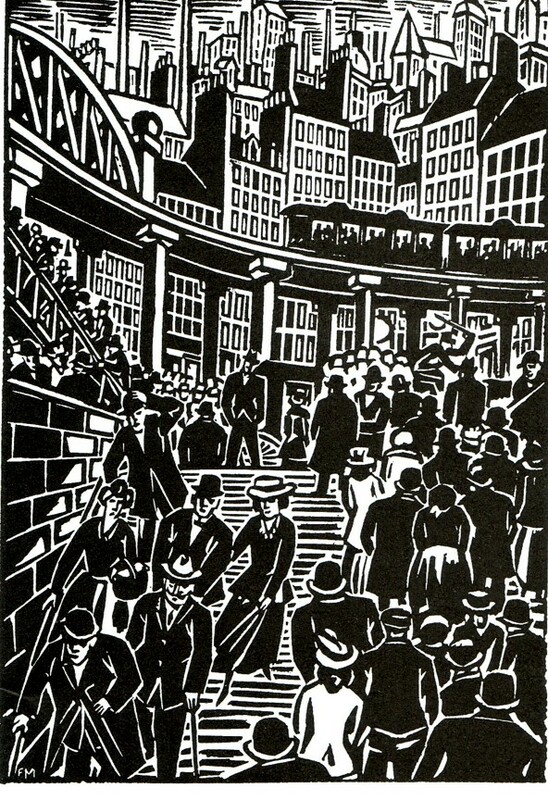 Frans Masereel (1889 – 1972) Belgian Woodcuts , actually wood engravings published to form wordless novels. Includes Passionate Journey (1919), The Sun (1919), Story Without Words (1920), The Idea (1920) Illustrated: The City.